Now that I think about it , since my childhood, I could not be categorised under the cookie-cutter label. In fact, I had this inkling all these years but only a few days back, the whole underlying principle sort of revealed itself. The process of growing and the environment one is operating into does shape one. This we all have heard but in what way it exactly shapes and what will be the product or what can be expected , I did not know in a very clear way. Many years ago when I had started on my work life, a colleague in my office did not know that stamps of certain value needed to put on to an envelope for it to be delivered by Indian postal system. I was surprised as this was as common knowledge to me as it was about wearing a shirt. This did give me an insight that process of growing had endowed me with certain information, knowledge or skill which many would have had no way to acquire. And this placed me at the advantageous level in many situations which work or life will throw. In all my job interviews I did try to share this insight with my recruiter that with me many intangibles come as well which you can not otherwise price nor put in your skill/ability requirements in the job description. Now that I am out of the job market, this insight in the more clear way has revealed. 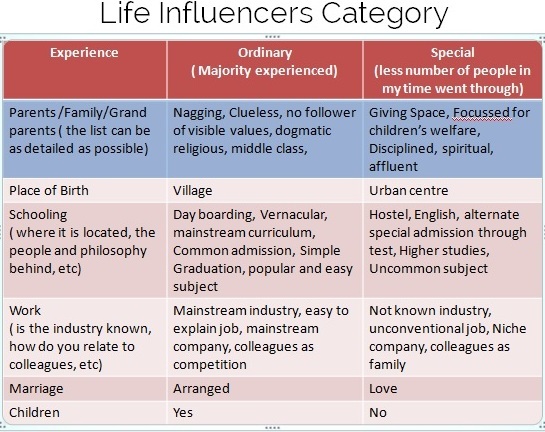 The whole list of influencers of life at all stages can be broadly categorised into 2 - ordinary ( which majority go through) or special ( much smaller percentage of population experience this). For example, family- the type of parents, their background, your own brothers and sisters, the role of freedom, schooling- boarding, day boarding, medium, mainstream or alternate curriculum, college, higher study, work- industry, niche or mainstream, relationship with colleagues, etc. 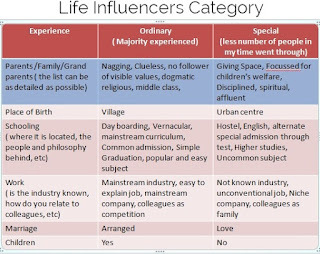 Basically, one has to look at one's life and identify the events and circumstances one has been put into and see it in the light of what people around have experienced and make the assessment accordingly as per the table to the left. The table is just to help focus the items and it is not conclusive and exhaustive by any means. However, this will surely give one an idea how one is impacted environmentally till then. It is important to know what others experience of life has been in that category of experience to get the real perspective. Just to share why this is so important. My initial and main years were in an organisation where all of us did the work in a certain way. Since all of us did that way and I did not have any information how others did , I had no idea that we were operating in a niche segment. Only when I joined the mainstream organisation , I realised that what is considered special here was the norm in my previous company without any one of us realising it. There are instances or situations in life when I am faced with the dilemma "what is the right response". The life principles straight way do not show the way or should I say they do not appear to be in quick implementation state. Not to bribe anyone is my life principle mainly because of the fact that I do not want to create an invisible blockage in the recipients' life. This principle is easy to implement when there is an alternate (even though more expensive) available to set things right, such as paying a hefty fine for traffic violations instead of bribing to save some money for oneself.However, this is not so straight when it comes to new constructions or modifications to the existing buildings. The overwhelming majority of old DDA flats have seen extension constructions by the rightful owners. Extensions could be either at the same level where more area has been covered by solid constructions or a level has been added either fully or partially. Most of these extensions appear to be the right thing to do from the optimal utilisation of resources. However, there is no legal recourse to this. But this has not deterred people from going for it. Extensions have been made to original DDA structures just by paying bribes to various authorities as a price for them to pretend that they do not know if such constructions have happened. Now this is sure shot trap where bribe has no right alternative. Since this has been done by almost all DDA flat owners, legal recourse must be available for them to come clean. The State must recognise this reality and take corrective steps where state and people benefit and not the government personnel who are only making money now. This way right climate is created which is without unnecessary fear and anxiety. It seems so normal to be bothered by unusual events in life. However, if I just suspend judgement, for the time being, things change in a very new way. Cares and concerns are the realms of mind and the real genesis of life lies somewhere else. So even logically there is really no reason to be bothered by whatever happens in life. The moment I learn to say so, I am set free. There have been many instances to prove that life only wants to test my resolve to be willing to see which is otherwise not visible then . And reward handsomely. All decisions which are not backed by logical conclusions are not necessarily inferior ones. In fact, my experience says they are the best and to go for. With this, I am able to forget bitterness and blames as well and move on for better. I recall an incident that I had sold my inverter scrap to the person who had installed it many years ago. The value of the deal was already settled and one day the team arrived to take care of the scrap. Once the things had left my house, the person in charge handed me a cheque for the value of the deal. I thought it a bit odd as the amount was small. Anyway, I let it pass and not make a fuss about it. When I was to deposit the cheque I noticed that the date on the cheque was for a couple of days later. Depositing the cheque was a small hassle as I had to go to the home branch for KYC updation and the branch had changed address. Anyway, I just went through the motion without holding any negativity any further. A couple of weeks later I received a call from my bank if I will come to collect the cheque or it should be posted. I did not understand this request but on more asking, it came to be known that cheque was returned because of the insufficient fund. I was now angry and I made the call to the inverter man but his phone was not reachable. I let it pass and continued with what I was doing. I made a second call some time later and again no connection. I did not allow this thought to create any mess and rather continued with what I was doing. Less than an hour later I received a knock on my door which is unusual and I see the inverter man on the door and I had a total surprised look on my face which was interpreted by that man as if I do not recognize him. I was just left speechless by this and this understanding got reinforced that there is absolutely no reason to fret and frown and store negativity on account of any incidents in life. If we know to handle our idle and lonely moments, we perhaps are the happiest beings around. Unfortunately that does not seem to be the case with most of us. In such times if we know the art of diving within or at least know that inside is the unending source of joy and energy, we would not know what is boredom. Boredom is the state when we are not aware of our own energy- a state of confusion- and to experience we attempt pseudo methods- watching TV or if you can afford go shopping. These two methods are supplemented by chit-chatting, playing games, social visits or programmes. Watching TV is the worst tool to get out of boredom as you do not feel your energy you are just oblivious. While shopping does offer you an opportunity to be impacted by others' energy and thus feel better. Others' energy does the trick. Nothing moves like money which is the quantifiable expression of ego. All actions which impact it positively ( mean enhance this) will be taken favourably and other actions which in the larger interests mean more for the more stakeholders will not cut ice. Responsible travel, environmentally positive style of work, etc are at worst the garb to rationalise our behaviour. It does not fill me with cynicism but makes me think more creatively to get the idea across of interests of the larger stakeholders must be taken in account when our behavious goes into the domain beyond us. I am the latest whose work has moved to Gurgaon now. And still wondering who has benefitted from the monstrous creation. It reminds me of Fatehpur Sikri which was created on the king's desire but later abondoned as it did not benefit large stakeholders. Every day I have been asking myself who has benefitted from the creation of Gurgaon and resounding answer has always been the builders whose only interests were the developed square feet which needed to be monetized soon. If the city has become a dust bowl , they do not care as they live far off. If the access to the building they have created is clogged, they are not really bothered as it is not their domain. If there is no green patch for miles around and drought and very unusual and disasterous weather pattern is imminent, it is not their concern. Would be nice to know how others feel about this.